An editor thought she did a great job running an anesthesiology journal. But her colleagues— including the new editor who took over for her—heartily disagree. During her tenure at the journal, the outgoing editor penned an editorial taking credit for the journal’s rise to success. But, according to a new commentary published in the journal, the former editor’s article presented wrong statistics, and minimized the contributions of those who had come before her. So when the new editor took office, he retracted it—and published the lengthy commentary explaining why. 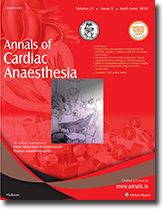 According to the new editor’s commentary, the 2017 editorial by the anesthesiology journal’s previous editor-in-chief, Poonam Malhotra Kapoor, was “full of misinformation.” Although Kapoor tried to correct a figure showing the increase in the journal’s impact factor, that wasn’t enough, according to the new editor Prabhat Tewari. [Kapoor’s editorial] glorified the then editor undermining the efforts of the past editors in nurturing the ACA. In this process of self-glorification a graph was presented that actually showed wrong statistics. None other than the then president of Indian Association of Cardiothoracic Vascular Anaesthesiologists (IACTA) brought that out for everybody’s knowledge. IACTA being the owners of ACA and having zero tolerance for fraud debated the issue in its annual meeting in 2017 in Pune, India. The prompt action taken by IACTA was to constitute a committee that looked into the whole matter. In the mean time, the then editor sensing trouble responded in her own way by putting up an erratum to her above mentioned editorial in the next issue of ACA. The nominated committee came to conclusion and gave the verdict that the editorial being full of misinformation should be retracted. It’s unclear whether Kapoor stepped down from her position as editor-in-chief over this issue. The retraction notice, published earlier this month, also mentions that Kapoor “has conflict of interest with many of the past editors of ACA” but does not provide more detail. We contacted Kapoor, a professor at All India Institute of Medical Sciences in New Delhi, and Tewari, a professor of anesthesiology at Sanjay Gandhi Post Graduate Institute of Medical Sciences in Lucknow, but did not hear back. It has been a conscientious bold attempt by me as an editor of this prestigious journal to give it an international look, with more original and review articles added in each issue and decrease the number of case reports, to make it an ideal platform for submission for SCOPUS, PUBMED CENTRAL (PMC), MEDLINE, and then expanded Science Citation Index. But in her correction, she notes that ACA was already indexed by SCOPUS, MEDLINE, and PMC. Tewari’s editorial also presents the backstory to another retraction of a 2017 paper, published in the same issue, issued after discovering that an author’s signature had been forged. …editors apart from following the good practices in scientific publishing, have really very tough task to point out fraud unless some good Samaritans wake up and help them out as it happened in the above two examples. I think, ultimately the onus lies on the institutions where such researchers work to take notice of these frauds and chalk out ways for actions against them that may work as deterrent for others not to tread that path. In the end I will salute IACTA the owners of ACA for its mercurial actions against fraud that will keep ACA as a beacon of good and responsible publishing and hope for generations.